The National Museum was opened in 1919 during the reign of King Amanullah Khan. From the beginning of the destructive civil war in the early 1990’s, the museum was looted resulting in a loss of 70% of its 100,000 objects on display. Many of the stolen objects have since been returned. Now, thousands of Afghan school children visit the museum to learn about Afghanistan’s Buddhist and Islamic past. Schoolchildren cluster around a black marble basin carved with Islamic inscriptions from the late fifteenth century CE. A lotus blossom chiseled on its underside led scholars to believe that the basin originally might have been Buddhist and centuries older. Schoolchildren observe metal and clay artifacts on display at the museum, some dating back to prehistoric times. 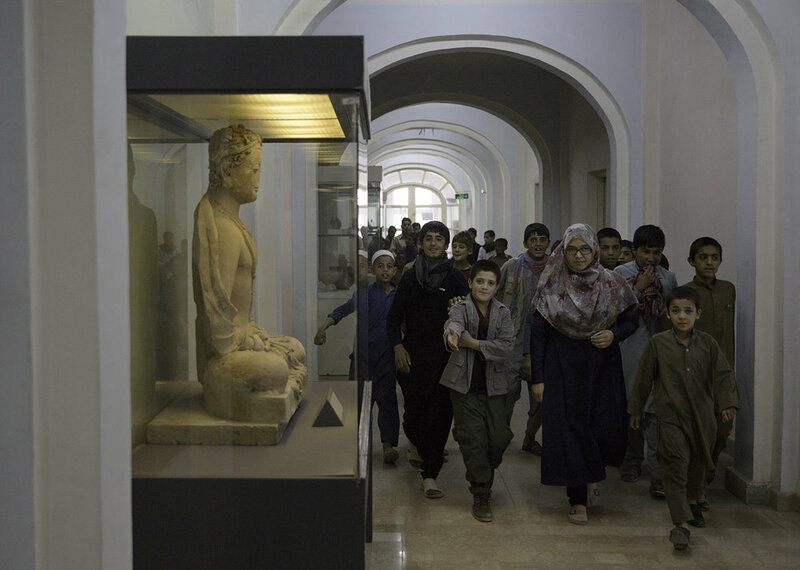 At the National Museum of Afghanistan, children file past a clay statue of a sitting Bodhisattva (third to fourth century CE from Tepe Maranjan outside Kabul) that was painstakingly repaired after the Taliban smashed it. 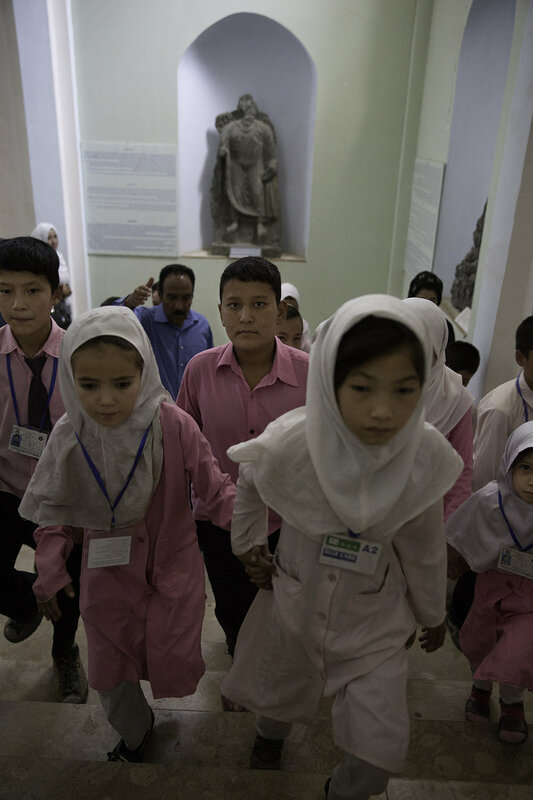 Schoolgirls and boys are guided past exhibits at the National Museum of Afghanistan in Kabul. The museum has become the centerpiece of attempts by Afghan educators to teach the post-war generation about their country’s rich and diverse culture. Schoolchildren gaze at one of the museum’s many rich ethnographic displays, exhibiting the traditional dresses, jewelry, and costumes worn by Afghanistan’s many ethnicities. 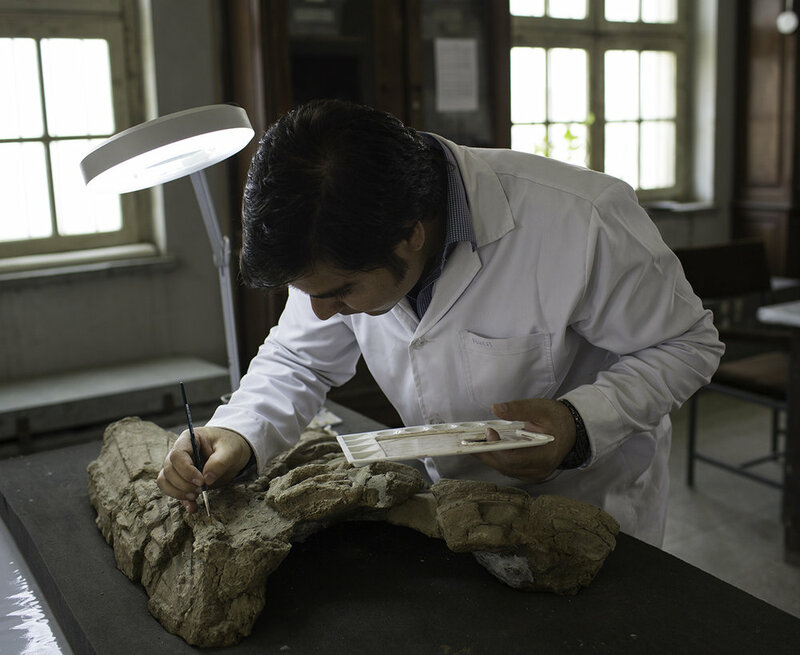 Field Director Alejandro Gallego Lopez, from the University of Chicago’s Oriental Institute, leads a team of Afghan and international museum specialists and conservators who are cataloging thousands of artifacts from Hadda destroyed by the Taliban. Museum Curator Basir Kamjo holds a damaged head of a Buddha from Hadda, in Nangarhar province, eastern Afghanistan. The Gandhara-era statues were destroyed when looters, and later the Taliban, ransacked the museum in 2001. Two women pass by a sign for the National Museum of Afghanistan located near the visitors’ center in the museum’s garden. The sign is written in Dari, Pashtu, and English. Two National Police officers open the metal gates to the National Museum of Afghanistan. This entrance, which looks across to Darulaman Palace, was installed in 2013 with funds from the U.S. Embassy, Kabul, to enhance security of vehicles entering the museum grounds.